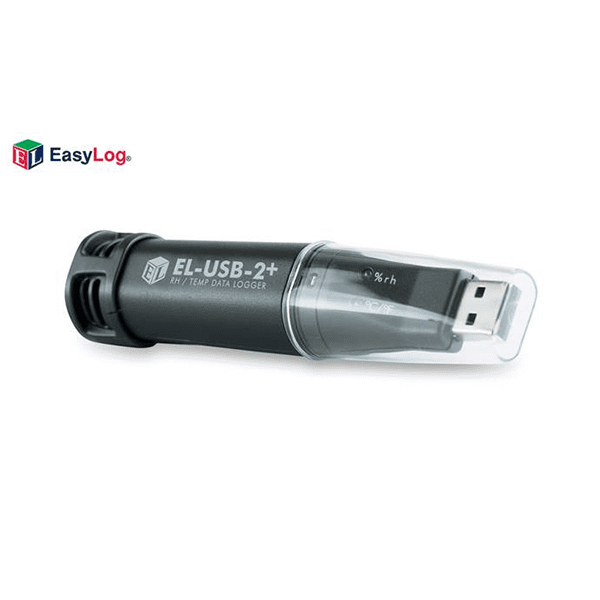 The Lascar EL-USB-2-Plus USB Temperature Humidity Data Logger is a standalone data logger that measures and stores up to 16,382 relative humidity and 16,382 temperature readings over 0 to 100%RH and -35°C to +80°C (-31°F to +176°F) measurement ranges. The user can easily set up the logging rate and start-time, and download the stored data by plugging the data logger into a PC’s USB port (not compatible with Mac unless used with the EL-DataPad) and running the purpose designed software under Windows 2000, XP and Vista (32-bit). Relative humidity, temperature and dew point (the temperature at which water vapor present in the air begins to condense) data can then be graphed, printed and exported to other applications. The data logger is supplied complete with a long-life lithium battery, which can typically allow logging for a year. Status indication is via flashing red and green LEDs. The logger is protected against water and dust to IP67 standard when the plastic cap and seal are fitted.